A quick update before Cam and I hit the road. 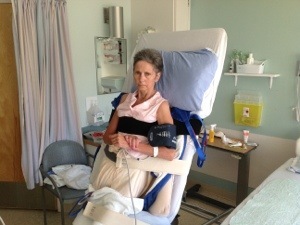 Janet was sleepy till 9:30 then had a quick change before Tom arrived to put her on the tilt table. She tolerated it really well and actually seemed quite relaxed the whole 35 minutes. Looking forward tom seeing her tomorrow night. I know you are all laughing at the picture so I will talk about that first. I DID NOT PUT THE BOOTY ON HER HEAD. Honest! I had put her into bed for dinner and put one booty on her tummy while I put the other on her foot. I knew she started playing with it and by the time I looked up to see what she was doing she had it on her head and was making it “just so”. I laughed so hard and scrambled to take a picture before she realized what she had done. With the picture taken I was able to laughingly tell her that is not a hat and she took it off. I laughed so much she actually smiled! It was a very enjoyable afternoon with Janet. I really missed her yesterday and was happy she was awake when I came in. Brenda was finishing her visit and had been singing to her when Janet woke up. I coached Brenda through some basic range of motion exercises she can do with Janet then had a little chat with Christi and Arlene. Christi mentioned some redness on Janet’s coccyx and we noticed some discoloration around her peg site. I asked Dr. Price to have a look and he said her coccyx is a little red but not nearly like it has been in the past so no worries there. When he came in I asked Janet to roll onto her side so he could look and she did! Dr. Price said he had not seen a peg site go the color Janet’s is right now but feels its just a mild reaction to the silver that was put on it a couple days ago. We will watch it closely. Laurel was a little concerned about Janet’s cough today so Dr. Price had a good listen and says her chest and lungs seem fine and the cough is likely a result of her inability to swallow effectively. I asked about that and he agreed to order a swallow test as it has been over a month since the last one. I think Janet is close to being able to try some food orally but not quite yet. The test will be interesting. I also asked him about the C diff. and he was unsure of protocol at KGH. Christi later said they will send another sample to the lab and if negative we are good to lose the gloves and gowns. Just as Dr. Price arrived so did Kiko ready to learn some range of motion stuff too. Kiko will stretch Janet out for us Saturday morning while I’m in Calgary and Laurel is in Vancouver. If anyone else has time to visit Friday afternoon or Saturday please do. Janet and I went for a little stroll to the beach then up to the front of KGH. She drove her wheelchair a little bit but not as well as previous. When I told her it was time to go in for dinner she immediately released the brake on her wheelchair! She actually took the handle right off and had a good look at it. Back in the room it was into bed for dinner and of course the booty hat. Janet fell asleep shortly after dinner stated to I went home to load the car up for Calgary. Cam has done a good job of getting ready. Laurel and I went back to say goodnight to Janet this evening and she was sound asleep. We got her into her PJ top and splint and left her to rest. Praying for a safe drive to Vancouver for Laurel, a safe flight to Vancouver for Raju, a safe drive to Calgary for Cam and I, and a joyous day for Nancy and Jim Church as their daughter Gillian is married tomorrow. 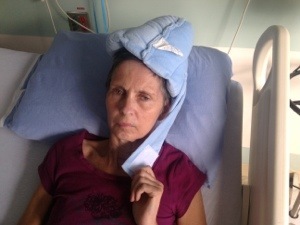 Praying also for Janet’s full and immediate healing. A very sleepy morning for Mom. The nurse said she was following commands extremely well as she was getting her cleaned up this morning, but since then she has seemed pretty tired. The report over the night was that she was “moving a lot throughout the night,” so I wouldn’t be surprised if she is catching up on missed sleep today. I also think she may just not be feeling the greatest. Tom did a physio workout that I felt was pretty lack lustre, so I planned to do an extra workout of my own with her afterward. Unfortunately, her sleep got a little in the way of that, but we did do some extra stretching eventually. A little reading and then she was back to sleep again, with a visit from Brenda on the agenda shortly after I left. Larry is headed down now, so hopefully she is caught up on sleep and ready for a good afternoon with him. Mom was a little more subdued this afternoon than this morning. Kiko stopped by for a couple of hours after I left this afternoon, but it sounds like Mom slept through most of it. Her only major nap today though, which was good. Kiko kindly came back as I was leaving at 8 this evening to try to catch Mom more awake, so I’m hoping she had better luck with her second try. Mom was quickly put in her wheelchair for an earlier dinner when I arrived, and I am guessing her knee pain was at least in part to do with her less bright, more worried expression. I propped her left foot up on some pillows while she was in her chair, which seemed to relax her somewhat. I had brought a pinwheel to try to help Mom with relearning some mouth movements (e.g., blowing on it to make it move), but she didn’t seem interested, nor did she really want to look much at books. Not her greatest few hours. Interestingly however, at one point I got up to throw my banana out and left my glove on my chair, and as I walked back to my chair Mom picked the glove up as if to make sure I didn’t sit on it and then put it back on my lap when I sat down. So cute. After dinner we went for a walk outside to try to perk her up, but she seemed a little overwhelmed going through the halls. A little better once outside, but better yet when finally back in bed. Best part of my week came as I leaned in to thank her for the day together and to say goodnight, and she began rubbing my back. So amazing. 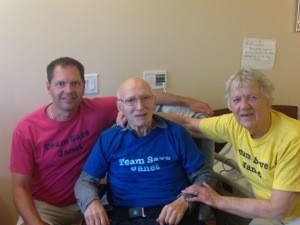 Had a quick visit with mom and dad in Nanaimo today while Laurel led things at KGH. It’s been three months since I’ve been able to see my dad and it was cool to put the team shirt on him. There are many people on the island praying for and cheering Janet on and I appreciate you all. if you want shirts let me know.